With Valentine's Day just 13 more days away, I thought I would share a recipe I found on Kraft food that maybe you could make for your sweetheart. -COOK noodles as directed on package, omitting salt. -MEANWHILE, brown meat with onions and garlic in large nonstick skillet. Add tomatoes and cream cheese spread; cook and stir 2 to 3 min. or until cream cheese is melted and mixture just comes to boil. Add spinach; cook and stir 1 min. Remove from heat, add 1/4 cup shredded cheese; stir until melted. -DRAIN noodles. Spoon 1/3 cup spinach mixture into each of 2 (2-cup) ramekins; top with noodle, letting excess noodle extend over rim of ramekin. Top each with 1/3 cup spinach mixture; fold noodle back over dish to cover filling. 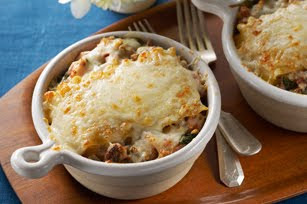 Repeat until all filling is folded between noodle layers; top with remaining shredded cheese. -BAKE 20 min. or until heated through. Let stand 5 min. before serving. SO YUMMY!!! I will surely have to try this!!! mmmm this look soo yummy.